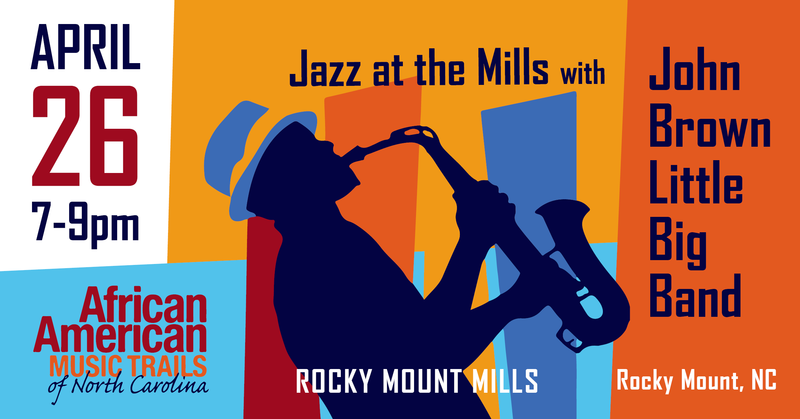 Join the John Brown Little Big Band for Jazz at the Mills from 7 to 9 p.m. inside the The Power House at Rocky Mount Mills for this powerful 11-piece band that has a BIG sound! The North Carolina Arts Council and Rocky Mount Mills are partnering together to present free concerts that celebrate Eastern North Carolina’s rich African American musical heritage this spring. Eastern North Carolinians are among the transformative figures in the history of jazz, gospel and popular music and this legacy was documented in the African American Music Trails of Eastern North, a guidebook to eight eastern counties.